The direction in which an aircraft is pointed is called the heading. The actual path in which an aircraft travels over the ground is called the track. 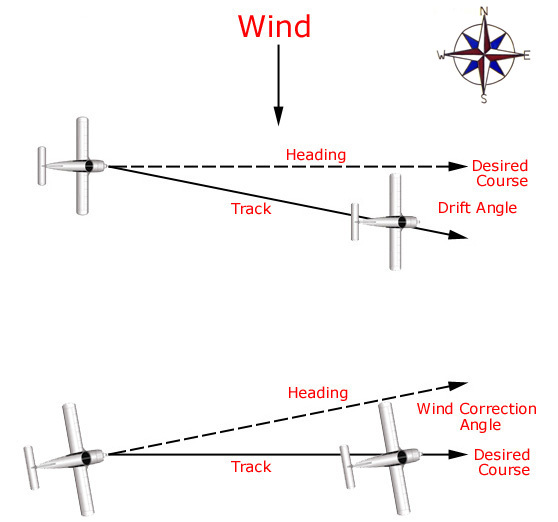 If an aircraft is flying straight into the wind, the aircraft true (geographical) course is calculated to be the same as the aircraft track. However, if the wind is coming at an aircraft from an angle (crosswind), the track and desired course will deviate. The angle between the desired course and the track is known as the drift angle. In order to maintain the aircraft track on the desired course, the heading must be corrected left or right, depending on the direction of the crosswind. If a crosswind is coming towards an aircraft from the left, the aircraft will drift to the right of the desired course. In order to counteract for drift, the aircraft must be turned to the left or into the wind. This is known as the wind correction angle and is expressed in terms of degrees. 1. AC-61-23A, Pilot's Handbook of Aeronautical Knowledge. (Washington, D.C.: Department of Transportation, Federal Aviation Administration, 1971). 76.